Heat oven to 350°F. Grease with shortening two 9-inch round cake pans. Line pan bottoms with cooking parchment paper; grease again, and sprinkle pans with flour. 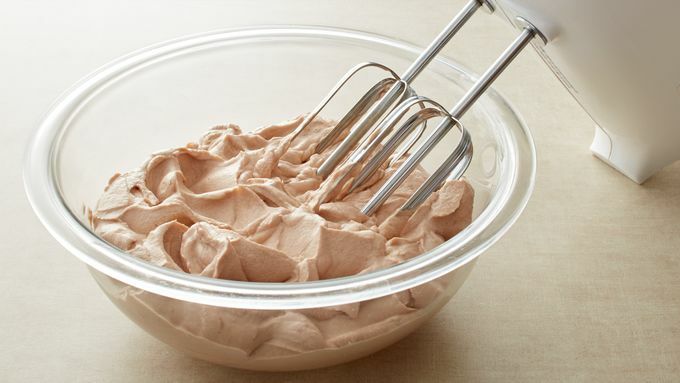 In large bowl, beat cake mix, water, oil and egg yolks with electric mixer on low speed until moistened. Scrape bowl; beat 2 minutes on medium speed. Spread batter evenly in pans. In another large bowl, beat egg whites with electric mixer on medium speed until foamy. Gradually add granulated sugar, beating on high speed until stiff peaks form. Fold in ground hazelnuts. Place spoonfuls of meringue on top of batter in each pan; carefully spread to cover batter to within 1/4 inch of sides of pans. Bake 30 to 35 minutes or until toothpick inserted in center comes out clean. 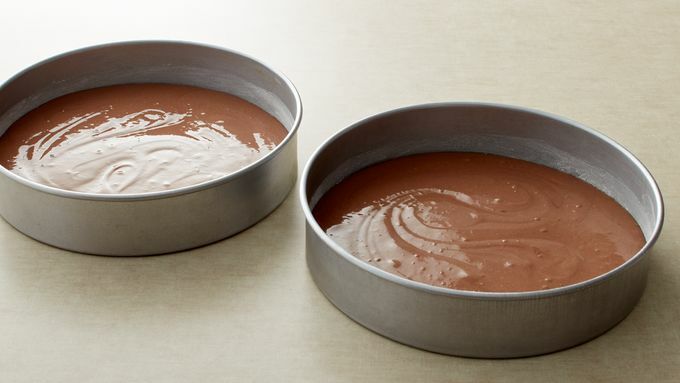 Cool in pans on cooling racks 15 minutes. Carefully run knife around sides of pans to loosen cake and meringue. 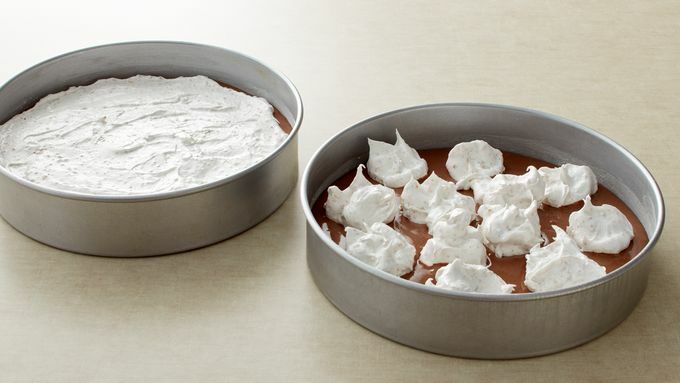 Remove from pans, and place meringue-side-up on cooling racks. Cool completely, about 1 hour. For topping, using chilled large bowl and beaters, beat whipping cream using electric mixer on medium speed until soft peaks form. Add 1/4 cup of the hazelnut spread and the powdered sugar; beat until stiff peaks form. 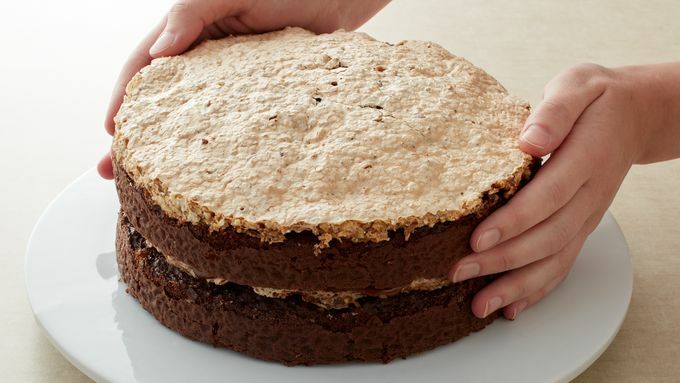 To assemble cake, place cake layer on serving plate or cake stand, meringue-side-up. Place remaining 1/3 cup hazelnut spread in small microwavable bowl. Microwave uncovered on High 15 to 30 seconds or just until softened. Carefully spread softened hazelnut spread over meringue layer. Top with remaining cake layer, meringue-side-up. Top with dollops of whipped cream mixture, spreading slightly to cover top of cake. Garnish top with candies. Refrigerate until ready to serve. To keep meringue from cracking when removing from pan, cover cooling rack with paper towel. Tip cake out of pan onto paper towel-lined rack, then turn cake onto another cooling rack to cool meringue-side-up. Remove paper towel. Change it up a bit! 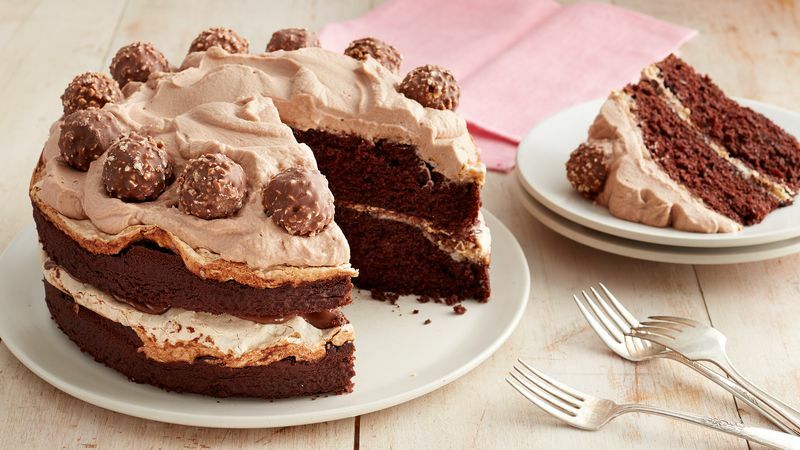 Drizzle additional melted hazelnut spread around top of cake. Egg whites will have a better volume when beaten at room temperature in a bowl that is clean and dry.